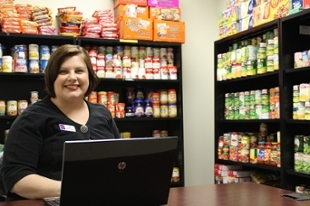 Middle Georgia State students (and faculty and staff) may visit the food pantry once a month during the semester to pick up donated food items. SHARE stands for Serving, Helping And Respecting Everyone. The project reflects stewardship, one of the Middle Georgia State's core values. It also supports the state's Complete College Georgia initiative, which pushes colleges to remove barriers that stand in the way of student success. The SHARE pantry is stocked with staple food items such as canned tuna, peanut butter and spaghetti sauce. Many of the items were donated by students, faculty and staff. Students, faculty and staff who show their MGA Knight ID cards can visit once per month during spring, summer and fall semesters to pick up five items each time. Those needing services outside of the established hours can contact the Macon Student Life office at 478.471.2710 or the Cochran Student Center at 478.934.3152 to make an appointment.